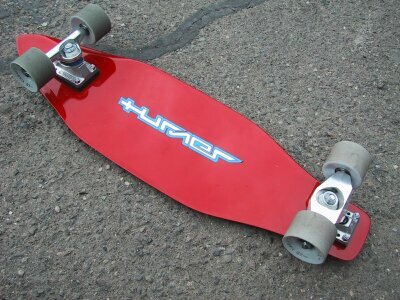 Here are some typical setups for Turner boards. Note that these are my personal boards, though my kids' (Lauren and Dylan) boards are set up almost identically, as are a number of other Turner team rider boards. If any other riders want us to host their board setup photos, let me know. Medium-stiff low camber fullnose built by Vince. Tracker RTX in front, Turner TTC 101 in rear, Cambria 86's in front, Cambria 82's in rear, Turner Abec 7 bearings around. Note a small amount of wedging in front and back using a full 1/8" urethane pad plus about 1/3 of another 1/8" pad to create a 3-4 degree wedge. Trucks are mounted using stainless hex buttom cap 10-32 screws with rubber lined steel washers to protect the top gelcoat. Dylan's board is identical in setup, though he has a yellow fullnose that Vince was able to build with extra soft flex, and he rips with this board (he took down Breamo at La Costa with it in first day elimination round). 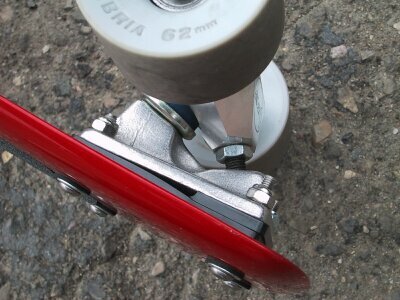 We typically pracice 5 - 6 ft straight and offset courses with these decks. 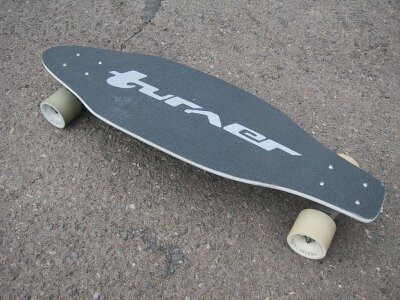 This board is typically set up with trimmed Avalon 85's front and 80's rear, Turner Abec 7's, Seismic 110 in front with silver springs, Turner TTC 101 in rear, same wedging as the fullnose but with one additional 1/8" riser in front and back because of the larger Avalons, and same stainless hardware, but without the washers. Dylan and Lauren run RTX's in front instead of the Seismic, and generally run with Cambrias instead of Avalons for somewhat better traction and speed control. 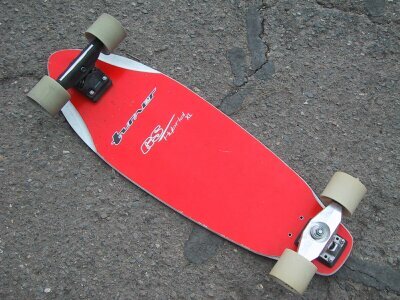 This is actually Lauren's board for 5 ft tight through big GS, though she'll often remove the spacers and tighten down the bearings on steeper courses. This setup, with minor variations, is far and away the winningest combination on the FCR tour (at least 5 pro division wins !). Turner GS/Hybrid XL - "fatboy"
This is far-and-away my favorite board, with Seismic 135mm w/silver springs in front and Turner TTC 101mm in rear, wedged the same as the hybrid. For practice, I generally run untrimmed Avalon 85/80 combo with Turner Abec 7's, though at Hood River I ran trimmed Avalon 85/80's, and in the La Costa GS I ran Cambria 82's front and 78's rear (soon to be in production) and had outstanding traction. I can run courses as tight as 6.0-6.5ft or wide open as the La Costa GS. Ahh, my 2nd Gen white cutaway with a "stiff" flex profile. Flat riser Seismic 110mm "hollow axle" front, rear urethane wedged back attached with stainless steel cap hex head/sealing washer hardware. Stinger wheels (soon to be changed to Cambrias), Oust Moc 7, custom grip work. This is an all time favorite board. It is one of my top choices for TS or Hybrid courses. Gotta have the Arizona flag on each of my boards, this one included. 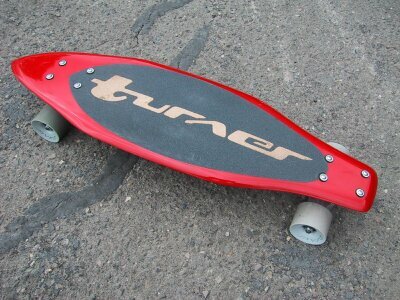 To check out what team turner is riding (and how they are setup) check ou the "team" section of the turner site. Most riders have a "slalom quiver" link which will show you exactally what they ride and how it is setup. Here are my 2 favorite Turners these days. The set-ups are a bit different and definitely feel different due to wheelbase and flex. First up is my early 90's 2tone cut-away med/stiff. Small pivot Fultrack up front weged out. Small pivot offset on the back wedged forward. 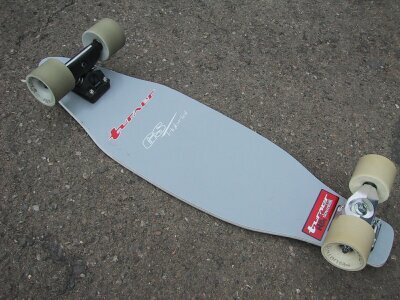 This board rides like it's on rails and is very hard on wheels. Wheelbase is 18 1/4 from inner truck mount to inner truck mount. True wheelbase is 20 inches on center. My NEW red Fulnose med/stiff has a small pivot Fultrack on the front wedged out. Back is a TTC that is wedged forward. Wheelbase is 17 1/8 inner truck mount to inner truck mount. True wheelbase is 19 1/2 inches on center. The black & Green is great for TS and Hybrid while the Fulnose is a TS monster only. PT Ceramics are all I use for bearings and I'm running those Sure Grip cushions on both back trucks. The blue in 93a for the Fultracks and the yellow in 89a for the TTC. 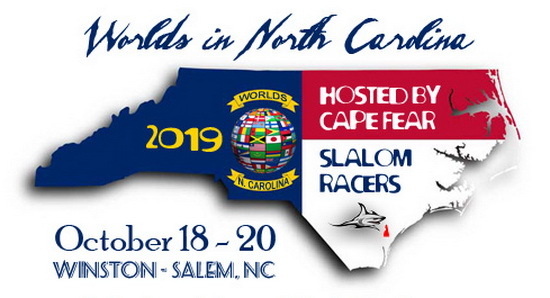 Still skatin, after all these years. 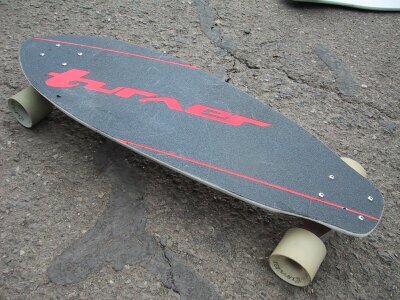 I just received my new 2003 Turner Fullnose Deck! Thank you so much Peggy!